Incredible Spray & Wipe Formulation!. 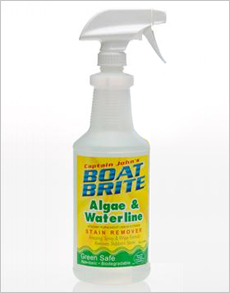 Works quickly on stains from algae, wet leaves, moss and tannins. Even cleans the Chesapeake Bay and ICW “beard”. Non-toxic formula…safe on gelcoat, paint and painted aluminum. Note: Product only available in the U.S. Shipping and handling quoted separately. © 2019 Abbess Online Store, All Rights Reserved.